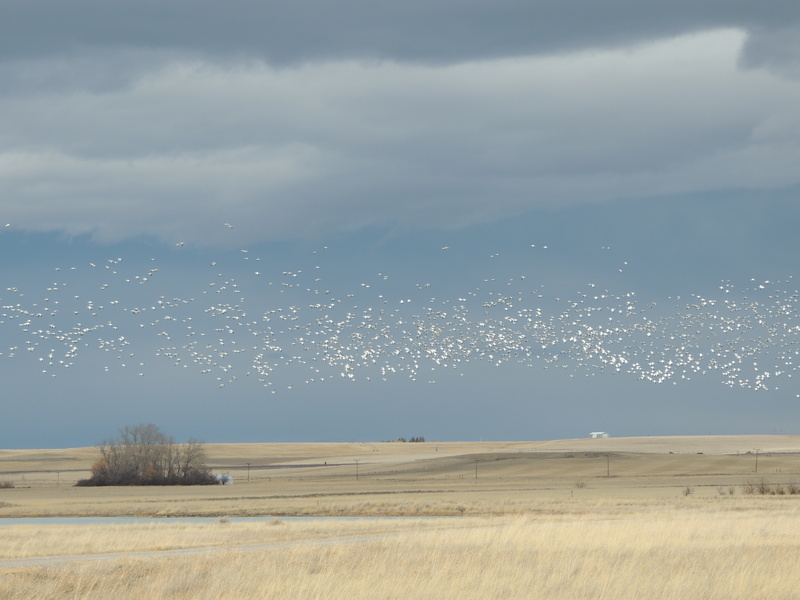 The snow geese are migrating, and earlier this week they were headed right for me. 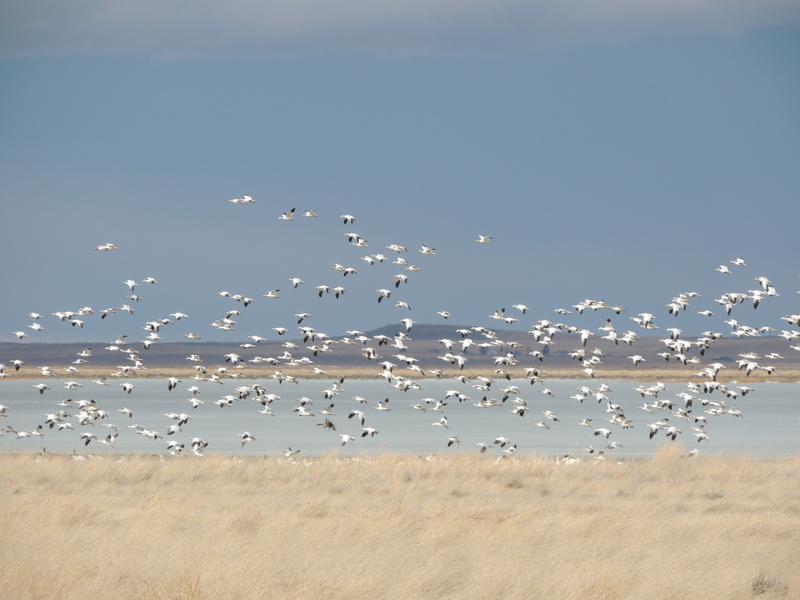 I’d heard that there were 35,000 snow geese at Freezout Lake in central Montana, so one afternoon we loaded up the camper and ended up camping on the prairie under a startlingly white strip of cloud. Seemed like a good omen. 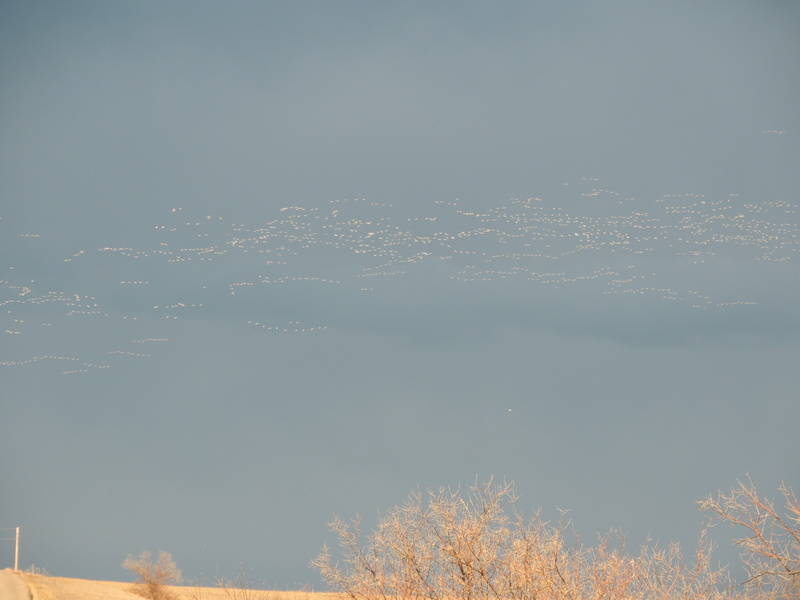 We wandered around, watching the geese flying in ahead of a brewing storm. 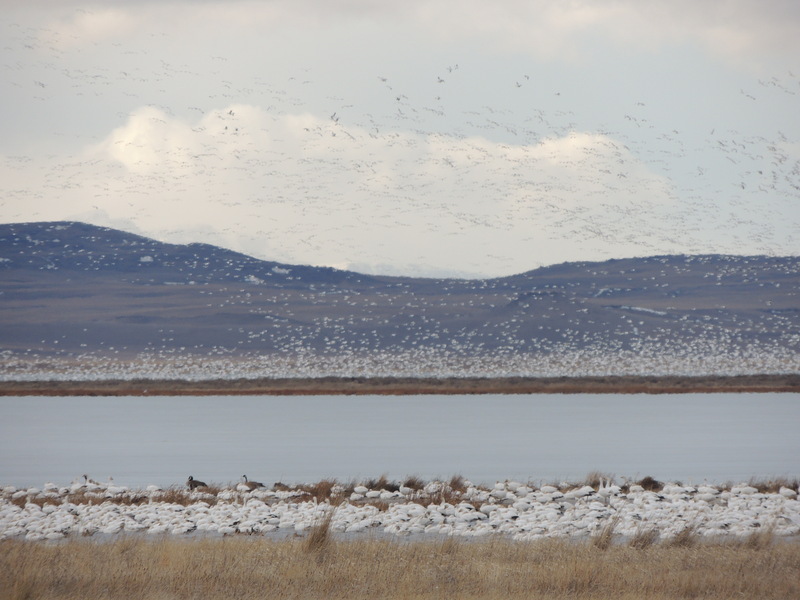 There were indeed many thousands of them, some resting on the shore, some landing on the still frozen lake, and many trying to squeeze into the small sections of lake that are free of ice. And more were arriving every minute. 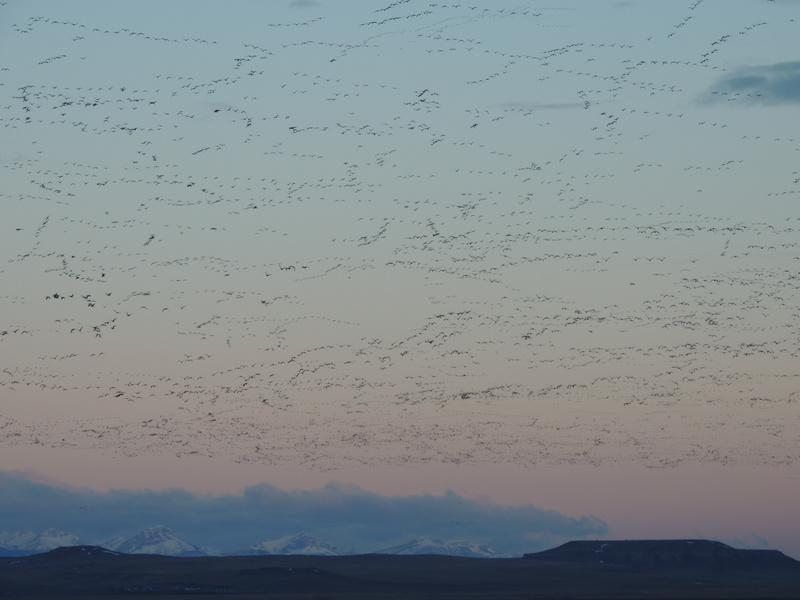 They continued to arrive long after sunset. 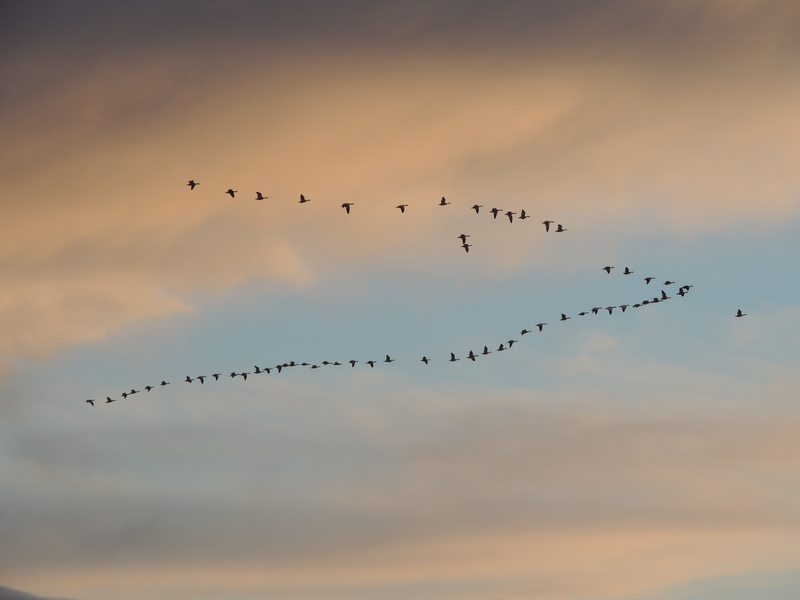 In fact, I heard them honking overhead all through the night. But the real magic happened at sunrise the next morning. It was cold, so we were having our coffee in the camper. 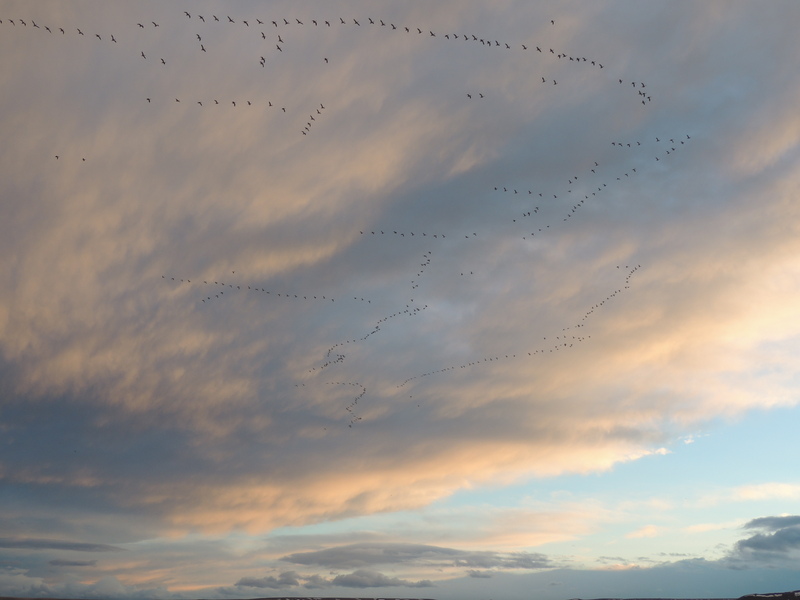 I heard honking getting louder and louder, and when we opened the door the sky was covered from horizon to horizon with skeins of geese, each of whom was loudly announcing that he was coming. What a sight! Here’s the photo I took, but I hope you’ll check out the short video as well – it gives a much better idea of what that moment was like. Oh nature….you’re pretty great. 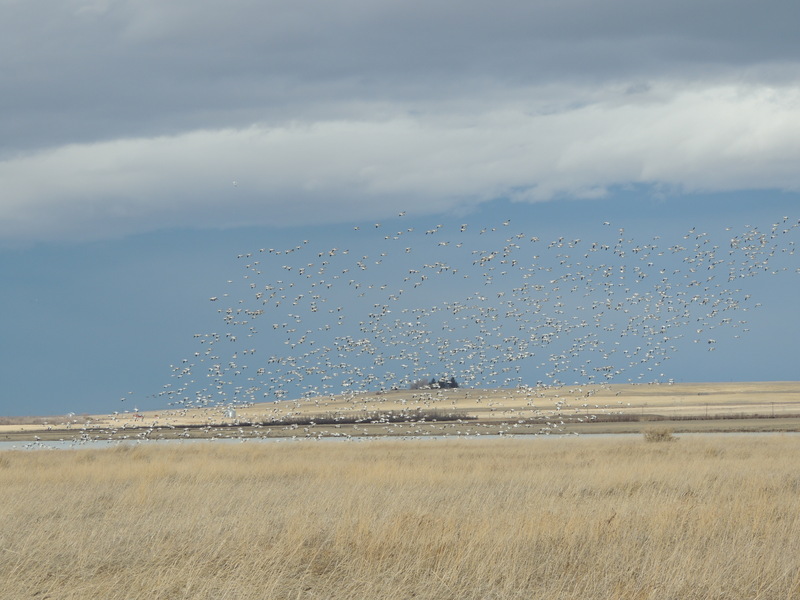 This entry was posted in Adventure, Birding, Camping, Montana, Nature, Outdoors, Wildlife and tagged Freezout Lake, Freezout Lake snow geese, Snow Geese, Snow Geese migration. Bookmark the permalink. 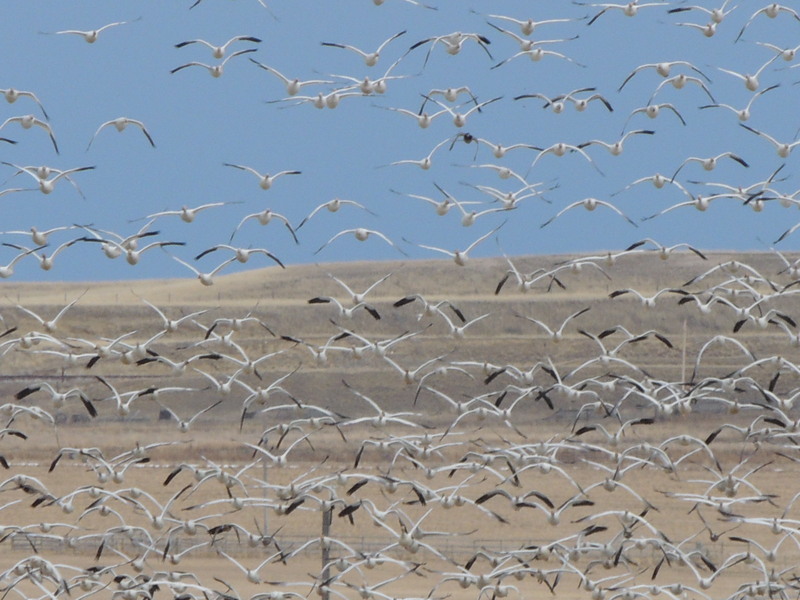 25 Responses to It’s Snowing Geese! You would have loved it, that’s for sure. That’s very cool! Great Captures. Thanks. Enjoyed finding your blog, as well. Such a crazy spectacle, thank you Cindy. And thanks for checking it out. Crazy, indeed. What a fantastic sight. Glad you were there to witness and capture it. Me too! Might go back soon if the geese keep hanging around. 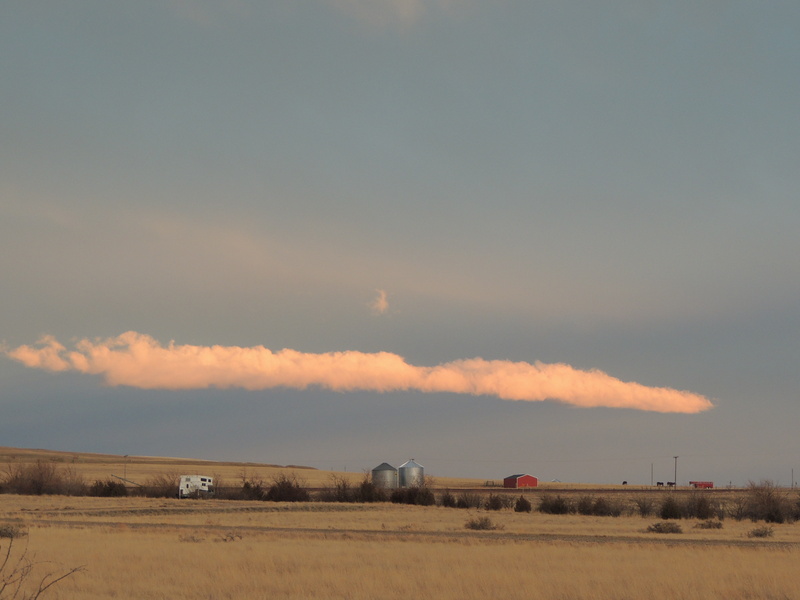 It is a sight worth seeing. Thanks. Wow! I’ve always wanted to see that. Maybe next year. Thrilling! 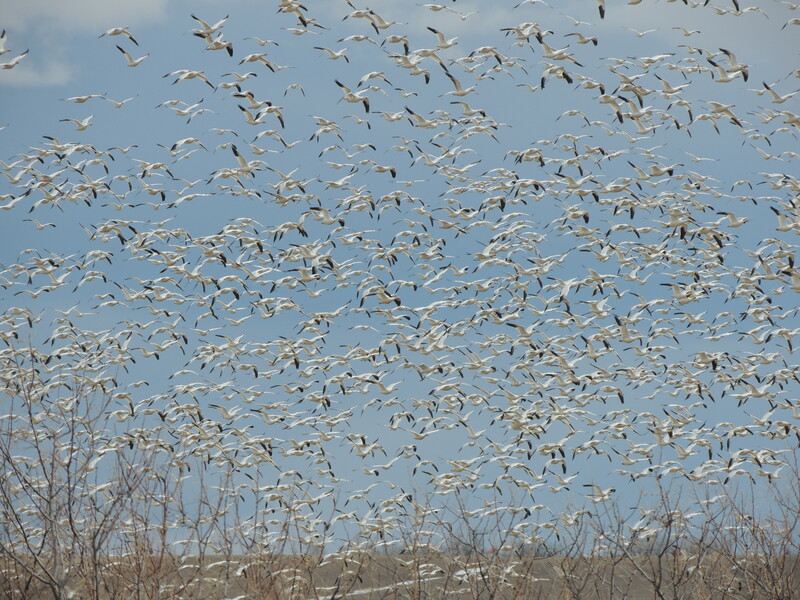 Seeing early morning flights of snow geese is on my bucket list! Good addition to your list! Wow! As I watched the video, I got goosebumps (no pun intended). Beautiful! Thanks for that lovely visit home, Cindy. Pretty great! A beautiful morning, animated. 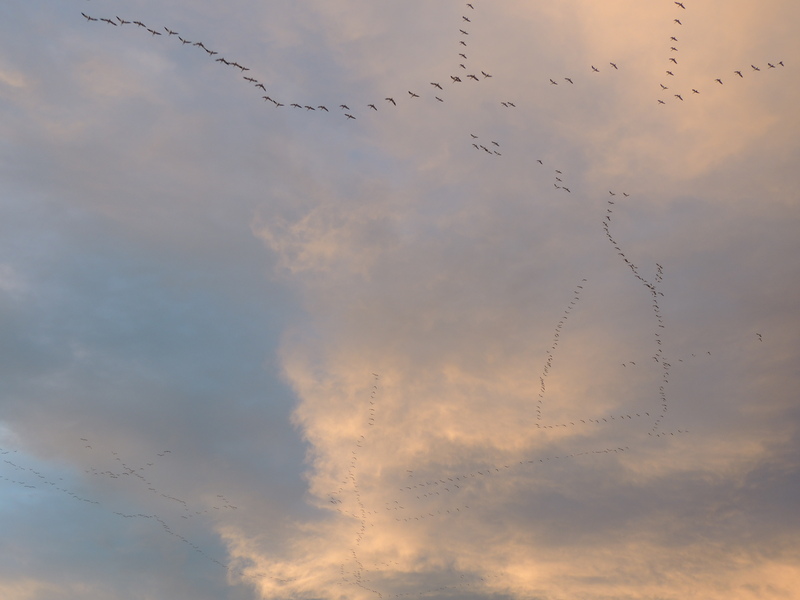 It is so good to see big flocks of them, isn’t it? Thanks for the gorgeous post. They are pretty wonderful. Thank you!